Rustic lake cottage with gorgeous view of pristine 40 acre lake nestled in the heart of Wisconsin's northwoods. We are located approximately 8 miles from Minocqua and 2 miles from the Bear Skin bike/snowmobile trail in Hazelhurst. The lake cottage sits on a slight hill overlooking beautiful Silver Lake, which is a no-wake lake. 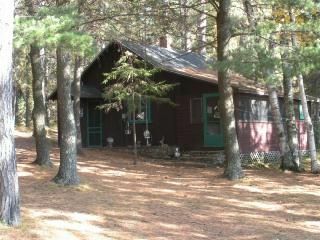 The property is nicely wooded and the cottage is surrounded with tall pine trees. You will enjoy many opportunities to enjoy nature at MY T Pine Acres. Deer are frequently seen passing through our property. You will also see a variety of summer songbirds; ducks swimming on the lake, eagles flying over head and loons swimming by and that will call late into the evening. The lake has a clear sand bottom swim area and a natural sand/grass beach. Take advantage of the sunshine on our large wooden raft. Enjoy the sparkling clear water sitting on one of two piers available for use or get a great tan relaxing on the sun deck. If you love to fish this rental includes a rowboat. There is also an old-fashioned paddleboat and a canoe available to use. Silver lake is plentiful in bass, pan fish and perch. Because this is a no-wake lake, you will not hear any loud motorized watercraft, which makes the lake very peaceful. This cottage boasts knotty pine interior throughout. It has two cozy bedrooms, each consisting of a double bed, ceiling fan/light, small dresser and small open closet. Both bedrooms are connected to a simple eat-in kitchen/living room area. This area has a ceiling fan/light, full size refrigerator, full size gas stove/oven, microwave as well as a sink and counter space for preparing meals.There is a kitchen table that seats four people. The living area also has a full size futon, chair and TV/DVD. Just off the kitchen/living room area to the front of the lake cottage is a large screened-in porch which has a wonderful view of the lake. The screened-in porch has a full size couch along with a patio table and two chairs. There is one full size bathroom with a shower stall, there is no bathtub and there is a ceiling fan/heater. The bathroom is accessed thru the enclosed screened-in porch. The lake cottage heat source is a space heater for cooler days/evenings in the spring and fall. Outside there is a charcoal grill if you choose to BBQ as well as a picnic table for eating outdoors. A fire pit/picnic area is available to use and it overlooks the lake for memorable late night bon-fires. The lake area and fire pit are a common shared area between this lake cottage and another onsite rental. Both piers, raft, sundeck, canoe and paddle boat are available for both rental properties to enjoy. If you are looking for something that is clean, cozy and comfortable that is close to everything, for a reasonable rate, then this is the place for you! Please inquire about pets. MY T Pine Acres is licensed with a Tourist Rooming House permit in Oneida County Wisconsin and holds a Sellers Permit issued in the State of Wisconsin. Clean, quaint and fun little cottage. This property was exceptionally clean and well maintained. Located on a beautiful small lake that has plenty of wildlife to watch, my wife and I enjoyed a week of peace and quiet. Being able to bring our dog along was a bonus. We will be back. My husband and I stayed here for the weekend with our dog and found it to be exactly what we needed. People looking for a week long rental on a lake would be very happy here. Everything is included except bath towels. It had a very nice stove and fridge, comfortable bedrooms, screened porch, piers to fish from and a fire pit. It was very easy to book and is clean and well maintained. Thanks for the nice compliment! Glad you enjoyed our lake cottage. Come back and see us again sometime. activities and festivals for which the Lakeland area is known.